This has been an interesting week. I mourned the loss of my PR successfully. Thanks for your kind comments. I took time off. I went to the pool. I ran slow. I ran fast. I took videos of squirrels sliding down the bird feeder pole (they went down super fast when I used cooking spray-it was freaking HILARIOUS). I did what I wanted to do. I drank beer and didn’t care. I got post-race euphoria. Again. Post-marathon run pre-post-race euphoria. Wouldn’t be classy without the smoothie seeds. 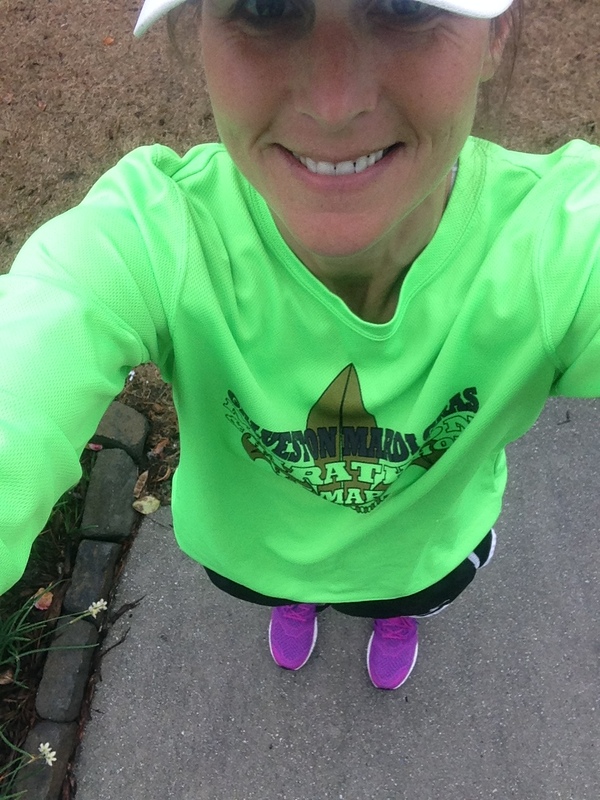 I’ve never done a shakeout run AFTER a marathon before, so on Monday, when my brain wires were all crossed, I decided to get out there and do it. I was slightly sore (definitive proof that I could have done better on Sunday), but I went two miles easily in the light rain. It was just enough to clear my head, work out residual soreness, and bring a smile to my face. It was perfect. 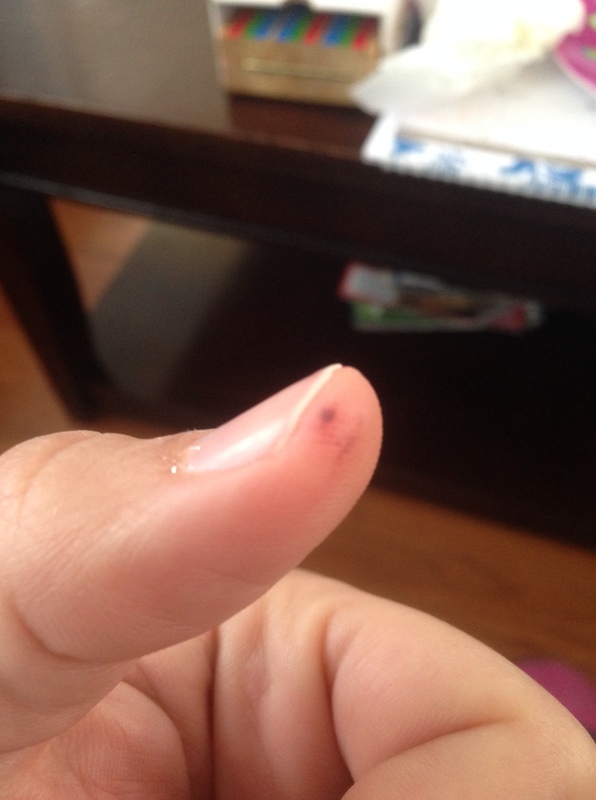 Then I noticed a blood blister on my thumb. Strange. I had done it while running the race on Sunday – I pinched the pad of my thumb with my index finger when I got upset in the last few miles enough to cause a blood blister. Strange…very strange. I was sad until Wednesday. 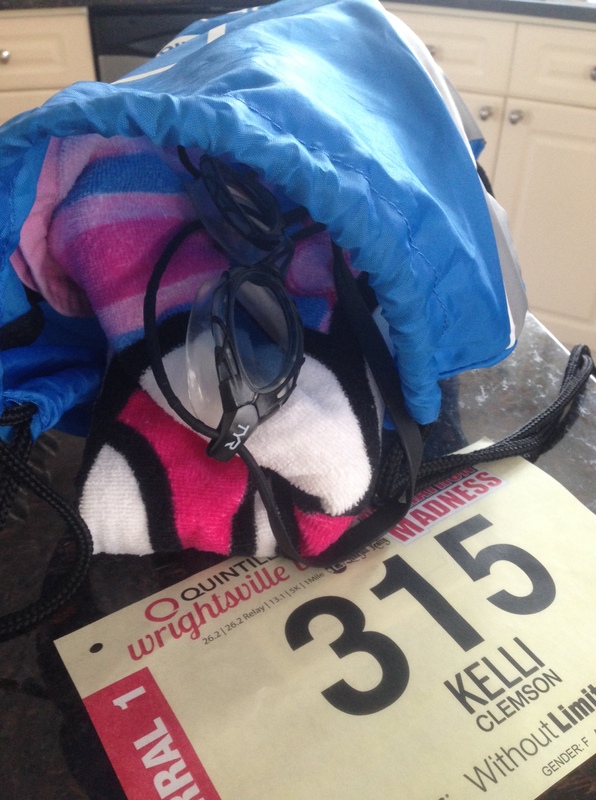 My soreness was gone, the sun was out, and I was ready to get back to it….slowly. I headed to the pool to re-acquaint myself with the water. It was, um, ok. I got out of breath VERY fast, but I practiced form for about 30 minutes, taking a breather after every 50 meters. I remembered what I learned at the swim clinic. Not sure if I could really execute it, but I tried. I was almost excited about getting back in the water. On Thursday, post-race euphoria hit. And I was happy. I was happy that I was happy and not the anvil-on-head feeling of devastation after Boston last year. I could feel the euphoria coming, like a train whistle in the distance, on Wednesday, but didn’t know how nutty it was going to make me feel. I dropped my son off from school, decided to go pick him up at noon and play hooky since he was just having a hard day and felt “invisible” and walked into the school looking pathetic like Eeyore or Winnie the Pooh, which was enough to make me cry while grocery shopping in Walmart. I assume the dumb U2 song, “Stuck in a Moment (and can’t get out of it)” coming on did not help matters. 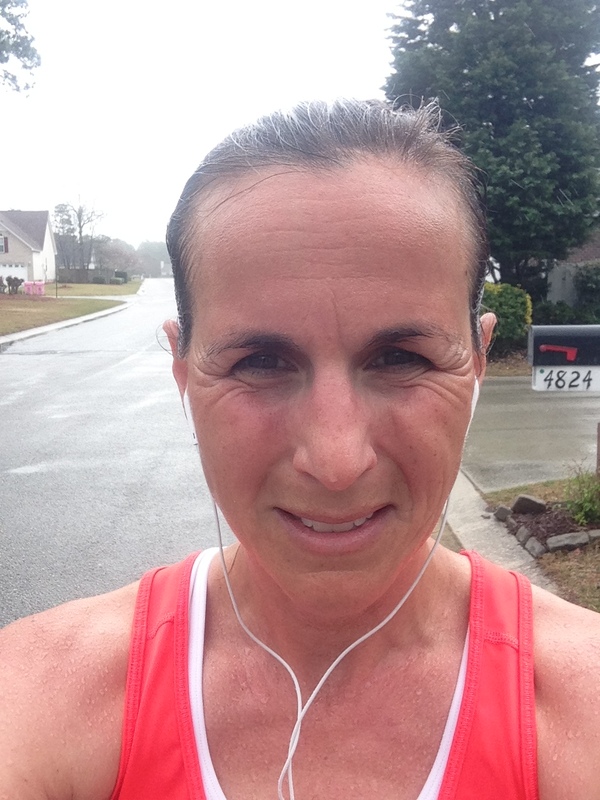 But first, I got the groceries put away, and again, went for a run in the rain. I ended up going about 3 miles at 8:15 pace. I didn’t have my hat so this is what I looked like most of the time. Dazed and confused. My legs were tired when I was done, but they weren’t tired enough to deter me from looking into running a marathon this weekend. And by the way, when I say, “post race euphoria”, it can also be called “making bad decisions within a week of running a marathon”. I’ve had this before, I’m experienced. I’d been watching the weather, and THIS weekend’s weather was going to be cold, which is PERFECT for me. Give me 30-something degrees and I’ll run all day long. Perfect for running another marathon, right? So I Googled all the marathons for the rest of the spring, including Grandma’s Marathon in Duluth, MN. I even got so far as looking into plane tickets. I think the $750+ air fare and the relative warm race conditions were the final slap to sensibility. Plus, duh, there’s Ironman training that is WAY more important than marathon racing right now. BUT there was a marathon this weekend, just up the coast. It was still open. Hmmm, I clicked the “REGISTRATION” button. (By they way, THAT is how the whole Ironman thing started…it was open, I clicked, I clicked again, and BAM, I’m in an Ironman). I checked the weather again. Hmmmm, rain and possible snow. The next screen after hitting the “click this if you’re a complete idiot” button, I found the registration was, in fact, closed. Ahhh, saved!!! I’m no marathon pro, but I DO know that running a marathon two weekends in a row for time is not a good idea. For anyone. I just had a brief moment of invincibility and that those particular rules to not pertain to me. Because I didn’t run all out on Sunday. 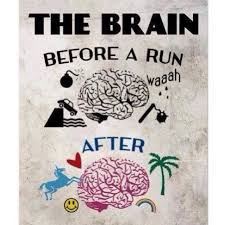 Yeah, so let’s run again a week later. Seems smart to me! That’s how tricky this euphoria thing is. I mean people, who actually clicks the button to sign up for a marathon that’s ONE WEEK from the marathon they just ran? INSANITY AT ITS BEST. That certainly wouldn’t have been a huge disaster, would it? I Googled more, looked at dates, weather, experiences of other people who ran marathons not long after Ironman races, and I think I’ve decided on when I will race a marathon again, but it will be after Ironman Florida. One thing at a time, Kelli, one thing at a time! Post-race euphoria, the best way to run up your credit card and do stupid things! Later on Thursday, I stole my son away from school at 12:30. There’s nothing like the ocean and ice cream custard, the most delicious invention EVER, and an afternoon out of school to elevate a pre-teen’s mood. We chatted, we collected shells, we laughed, we put our feet in the ocean, we took goofy pictures. It was wonderful, and it worked. 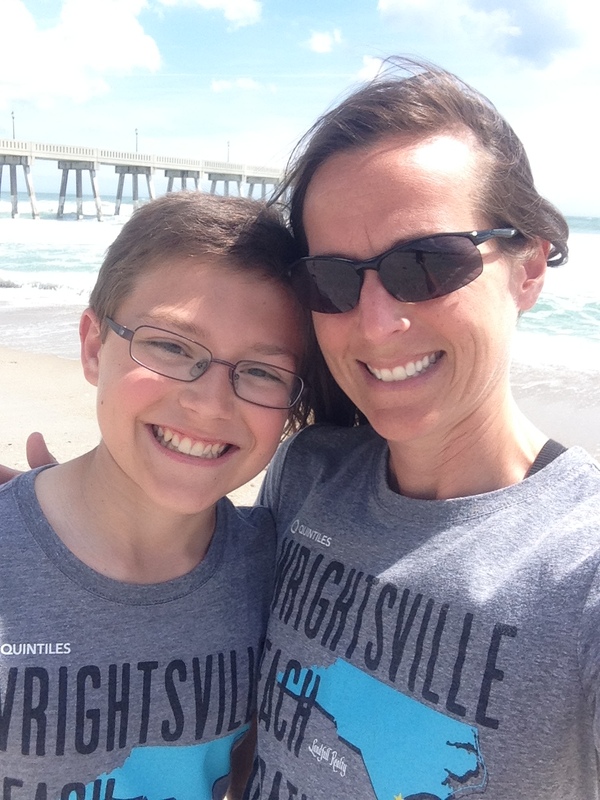 My boy and me, at Wrightsville Beach, wearing Wrightsville Beach shirts, just in case we got lost, because, you know, there’s a map on the shirt. So anyway, today is Friday. I decided to take the day off any exercise. The kids got out of school early for spring break, which is all next week, so we went to Lowe’s and got some supplies to build a flower bed around a tree in the front yard. Our neighbors and we were planning to have a nice big bed combined in our front yards, but they are moving and decided instead to put one bush up surrounded by a few handfuls of mulch. It’s gorgeous and could be a contender for Better Homes & Gardens “Front Yard Award”. Yeah, I’m totally exaggerating, it looks like crap. I’ll post a picture when we get it done. I’m fighting the urge to buy a bunch of books on endurance nutrition and the best method, as I know it’s part of the euphoria effect. I want to know all the things about all the diets, but I am especially curious about Nutritional Ketosis. Not sure if it is even a good idea with my history and a very long endurance event planned, but I’m going to be looking more into my options. For workouts this weekend, I’ll be on my trainer for “all the miles” (euphoria) and then I’ll be doing some running as well. I’m also planning to be at the pool 2-3 times a week, so we may all head there on Sunday for more practice. Then we’re heading to the Harlem Globetrotters game. My kids are going to have a blast! What is everyone up to? Do you ever go nuts after a marathon?